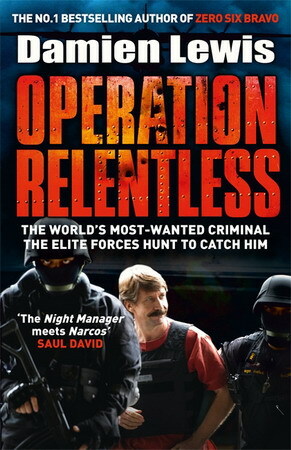 Operation Relentless is the gripping story of the years-long effort to catch arms dealer Viktor Bout, nicknamed ‘The Merchant of Death’ and ‘The Lord of War’. Damien Lewis, author of the best-selling special forces book Zero Six Bravo, does an impressive job of turning the facts into a thriller-like package. Although it is clear Lewis takes liberty in describing some of the conversations, feelings and actions of the book’s motley subjects, it does make Operation Relentless an easy and entertaining read that is more akin to a James Bond novel than a work of non-fiction. Nevertheless the book is based on extensive research, including accessing US Drug Enforcement Agency (DEA) transcripts, court testimony, interviews and information on Bout’s seized computer. “Two major conflicts in recent history have dominated news headlines: the wars in Iraq and Afghanistan,” Lewis writes. “However, this same period has witnessed other, equally devastating wars… In Angola, Rwanda, the Congo, Sudan and Sierra Leone these ‘second level’ conflicts rumbled on largely unnoticed by the outside world, yet claiming a far great loss of life than both the Iraq and Afghan wars combined. In the Congo alone some five million are estimated to have died. These conflicts were perpetuated in large part by the clandestine flow of weaponry to these parts of the world. Lewis brings together a wide cast of fascinating characters that hinge around Bout. Mike Snow, a former British soldier and bush pilot was recruited by the DEA as a confidential source on Operation Relentless and together with Bout associate Andrew Smulian, a former South African Air Force officer and bush pilot, were instrumental in putting Bout behind bars. Snow’s adventures as a sometimes shady, small time air operations manager occupy a number of chapters, as Snow was vital in getting Smulian to unwittingly gather enough evidence to put Bout in prison, along with several DEA employees, who posed as Colombian FARC rebels and got Bout to promise to supply them with surface-to-air missiles, small arms, grenades and rockets, amongst others. It was this elaborate sting operation that finally nabbed Bout after more than a decade of pursuit. One of the things that strengthened the DEA’s case was that they got Bout to admit he was at war with the United States and was complicit in the death of American citizens by agreeing to supply the FARC with weapons. Bout’s philosophy was to never fly empty and this, together with his view that no-one should shoot the postman, were some of the reasons for his successful airline ventures, along with his gift for languages. Born in 1967 in Tajikistan, Bout entered the Soviet military’s Institute of Foreign Languages before being sent to Mozambique in 1987 when he fell in love with Africa. In 1993 he set up an air freight company in Brussels and went into business with Peter Mirchev, a Bulgarian arms dealer. Angola and Afghanistan were his earliest customers. Was Bout a businessman who would fly anything and everything, including arms, or was he indeed The Merchant of Death? It seems he was someone who would fly anything, anywhere, by any means. Apart from weapons this included Tilapia fish from Africa to Europe, frozen chickens to Nigeria, peacekeepers into conflict zones and aid into areas of unrest. In 1997 Bout’s aircraft were vital in flying refugees around the Congo and aid for the UN World Food Programme, while at the same time flying weapons around that very country – his aircraft were very busy during the Second Congo War. By 1999 the United Nations had discovered that Bout was flying arms around Africa but there was no way to prosecute him even though he was violating UN arms embargoes. By the 2000s Bout’s empire was worth billions of dollars, employed several hundred people and dozens of mostly ex-Soviet aircraft. Bout flew anything, anywhere and in 2004 it emerged that Bout’s companies had been contracted by the US military to fly supplies and equipment into Iraq for the Coalition Provisional Authority (CPA), and the US Department of Defence had even refuelled his aircraft in Baghdad. After this embarrassing episode, in July 2004 US President George W Bush signed a Presidential Executive Order declaring Bout “an unusual and extraordinary threat to the foreign policy of the United States,” and the United States started going after him where it hurt by seizing his assets. With Snow luring Bout’s trusted former deputy Smulian into the trap, the DEA set the scene for the elaborate FARC sting. Over the course of two years the DEA worked to successfully get Bout and Smulian to agree to sell weapons to the FARC. With meetings in Curacao, Russia, Denmark and Romania, things came to a head in March 2008 when Bout agreed to meet the ‘FARC representatives’ in Thailand. He was arrested along with Smulian, but it took two years to extradite him to the United States for trial, due in part to political interference from Russia. The US Grand Jury indictment stated that Bout was an “international weapons trafficker” who, in order “to provide cover for his illicit arms transactions…developed an international network of front companies, and used his cargo airplanes to deliver lawful goods, such as food and medical supplies, in addition to arms.” He was charged with conspiracy to kill US nationals; providing the FARC with weapons; and conspiracy to acquire and use anti-aircraft missiles to enable the FARC to attack US aircraft in Colombia. Bout, and Smulian, were also charged by the United States with conspiracy to provide material support to a terrorist organisation.